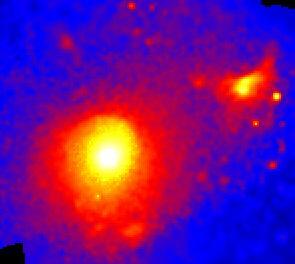 False-color view of the X-ray emission from the central part of the Virgo cluster. This image is centered on M87. The second brightest X-ray source in the upper right is M86, which traverses the hot intergalactic medium at high peculiar velocity, and thus causes heavy interaction; due to this effect, it has a comet-like shape.